OMG Posters! » Archive "Declaration" Art Print by Saber (Onsale Info) - OMG Posters! Hecho Con Ganas will drop a new art print by graf legend Saber tomorrow. 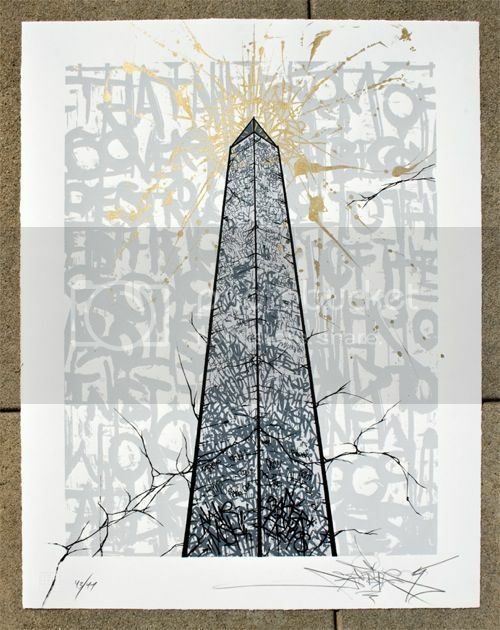 “Declaration” is a 21″ x 27.5″ screenprint, has an edition of 47, and will be $60. There will also be 5 HPMs, all hand-tagged by Saber in spray paint, for $100 each. The prints go up tomorrow (Tuesday, September 29th) at a random time. Visit HechoConGanas.com. I usually steer away from having a political edge in my art, but inherently the act of Graffiti alone is a political act, and recently I’ve found myself being pulled strongly in that direction. So I think it was the natural next step for me to want to combine the textures I use and see in the urban environment, with American icons. 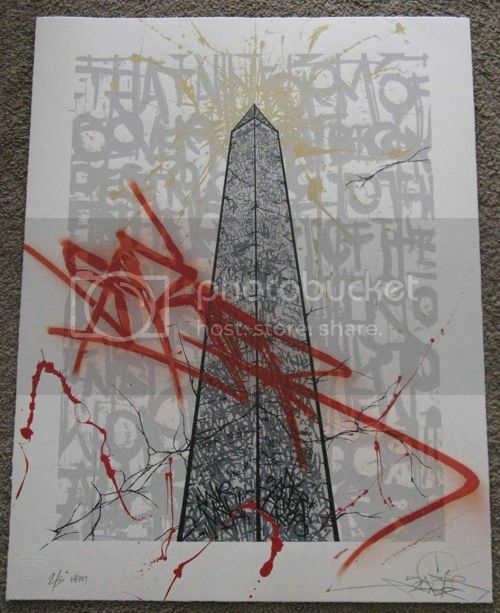 In this print you see the Washington Monument. The image, at first glance to has an apocalyptic vibe, but looking further you see that the essence is actually from deconstruction, and is a way to test revolutionary ideas through the safety of visual media. All of the names scrawled into the crumbling obelisk are of those who broke the status quo with their determination to make their mark on society, rejecting existing traditions of artistic expression. To help represent this idea, I chose a line from the Declaration Of Independence that seemed to fit the current frustrations. “That whenever any Form of Government becomes destructive of these ends, it is the Right of the People to alter or to abolish it, and to institute new Government” (World).